SurvitecZodiac has received an important order for Autolaunch escape systems and liferafts from Baltic Workboats in Nasva, Estonia. The systems will be delivered early this year for installation aboard the first of two new vessels being built for the Swedish transport authority’s ferry company, Färjerederiet. The new ferry is due for completion in 2017 and will become a sister ship to the Saturnus which is currently the largest vessel in the Färjerederiet fleet. With a length of 100 meters and a beam of 18 metres the new ships are the largest built at the Estonian yard. It will have the capacity to carry up to 297 passengers and 80 cars along routes on Swedish waterways. When it enters service the new ferry will function with a crew of only 3. The SurvitecZodiac Autolaunch evacuation systems will consequently be an important feature of the ferry’s operational capability. If there are few crew available, the pressure of other emergency duties can make it difficult for them to prepare, launch and bowse a liferaft and its slide. The Autolaunch escape slides and liferafts can therefore be deployed at the touch of a button in the wheelhouse when they will become fully inflated and ready for use in less than two minutes. The design of the Autolaunch system can also save vital minutes in an emergency by enabling multiple slides and rafts to be deployed simultaneously. The new ferry is being built according to Finnish-Swedish ice class rule 1B, for which it must be able to maintain a speed of at least 5 knots while operating in a channel with up to 80cm of brash ice. By eliminating the need for any crew intervention, the Autolaunch systems will make it possible to operate safely in the extreme conditions that can sometimes be encountered on Baltic routes. SurvitecZodiac will deliver the Autolaunch systems which will include an open reversible liferaft capable of carrying 151 people. Passengers will be able to board the rafts via short, 1.7 metre escape slides which are quickly inflated when activated from the ship’s bridge. 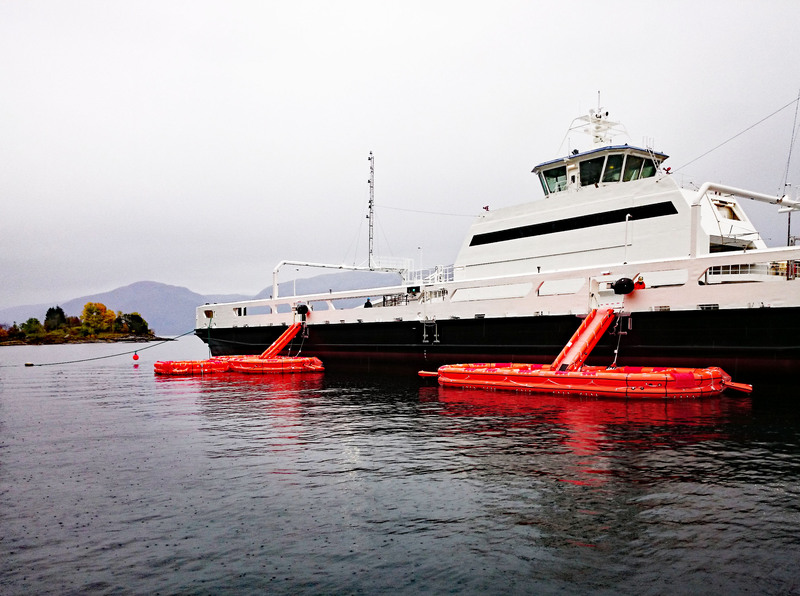 The Autolaunch slides supplied have been specifically designed for use by passenger vessels with low freeboard and a need to rapidly transfer large numbers of people into liferafts. Although a ship with low freeboard may appear to be relatively easy to abandon, it can still be a time-consuming challenge for passengers unfamiliar with such activity. A slide is a safe, simple and speedy way of moving a large number of people from one location to another and is therefore the ideal solution for a ferry. The system also includes a pull-up bar which allows disabled persons to access the slide even from a wheelchair while very young, aged or infirm persons can be assisted down the slide by another person. The slides and rafts for Baltic Workboats are being manufactured at the SurvitecZodiac factory in Chevanceaux, France. This is one of the most advanced factories in the Survitec Group which is a leading innovator in rescue system technology. The group’s product portfolio includes some of the most reputable brands in the safety and survival equipment industry. Key products within Survitec Group include marine, defence and aviation liferafts, escape slides and world-leading submarine escape technology. The company also manufactures lifejackets for commercial airlines and the offshore industry as well as pilot flight equipment including anti-g clothing used for the Eurofighter and JSF programmes. The entire Survitec Group employs approximately 2,000 people across eight manufacturing sites and 50 service centre locations with a further global service and distribution network of over 550 dealers and agents. Each manufacturing facility employs a dedicated research and development team that continuously works to improve every product and establish or maintain a lead within its own market sector.